1 As your mediator. I am a neutral professional who helps you and your spouse reach a divorce mediation settlement and as an attorney-mediator I can prepare the legal agreement for court filing. Our mediation sessions provide an opportunity to share information and to make decisions. In between sessions and at the end of divorce mediation, you and your spouse can consult with your own attorneys for advice and guidance. This is a voluntary and private mediation process that can help you preserve a relationship with your former spouse, while planning for your future goals. 2 As your attorney when you are in mediation. 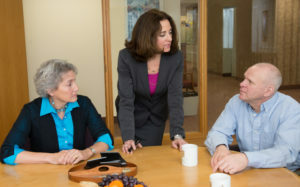 If you are in mediation in Massachusetts now, or plan to be soon, I can provide you with information and advice as you go through the divorce mediation process. When you receive the final agreement we can review it together and discuss your goals and options so that you are confident that you have made good choices. 3 As a mediator to help you stay married. This process is called mediation to stay married. In mediation to stay married, you and your spouse will work on issues which are necessary to try to avoid divorce.